Murrplastik is able to provide fully populated dress pack solutions for any robotic application. Universal applicable fastening elements for all standard robots can be combined into individual designs that provide a rugged hardness for the hydraulic, pneumatic, and electronic components contained within the dress pack. Murrplastik will assemble and ship the dress packs, including their cables, connectors, and other content as one unit. Their specially developed cable protection conduits for complex robot applications can stand up to extreme stress and movement. Specially modified materials and special conduit geometry ensure optimal protection and long lives. 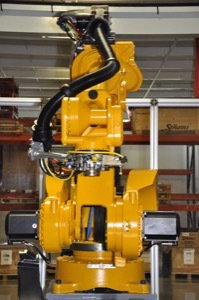 The R-Tec Box is an axis 3 to 6 energy package for industrial robots. It is specially designed to house the unique integrated spring return system which keeps the conduit tight to the robot so that it is not caught or in the way during operation. The spring package allows for the robot to make a wide range of movements while still keeping the cables and hoses organized, protected, and out of harm's way. We can work with you to design a dress pack specific to your robot's application and environment. For more information, please contact your salesperson or call 800-228-2790. Thank you!